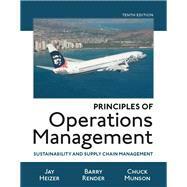 For a more comprehensive version with the business analytic modules at the end of the text, see Heizer/Render’s Operations Management: Sustainability and Supply Chain Management Plus MyOMLab with Pearson eText -- Access Card Package, 12/e (0134422406 / 9780134422404). Dr. Heizer’s industrial experience is extensive. He learned the practical side of operations management as a machinist apprentice at Foringer and Company, as a production planner for Westinghouse Airbrake, and at General Dynamics, where he worked in engineering administration. In addition, he has been actively involved in consulting in the OM and MIS areas for a variety of organizations, including Philip Morris, Firestone, Dixie Container Corporation, Columbia Industries, and Tenneco. He holds the CPIM certification from APICS—the Association for Operations Management. Professor Heizer has co-authored 5 books and has published more than 30 articles on a variety of management topics. His papers have appeared in the Academy of Management Journal, Journal of Purchasing, Personnel Psychology, Production & Inventory Control Management, APICS—The Performance Advantage, Journal of Management History, IIE Solutions, and Engineering Management, among others. He has taught operations management courses in undergraduate, graduate, and executive programs. Dr. Render has taught operations management courses in Rollins College’s MBA and Executive MBA programs. He has received that school’s Welsh Award as leading Professor and was selected by Roosevelt University as the 1996 recipient of the St. Claire Drake Award for Outstanding Scholarship. In 2005, Dr. Render received the Rollins College MBA Student Award for Best Overall Course, and in 2009 was named Professor of the Year by full-time MBA students.